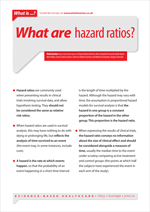 What are hazard ratios? | Whatis Series...? Hazard ratios are commonly used when presenting results in clinical trials involving survival data, and allow hypothesis testing. They should not be considered the same as relative risk ratios. When hazard ratios are used in survival analysis, this may have nothing to do with dying or prolonging life, but reflects the analysis of time survived to an event (the event may, in some instances, include cure). A hazard is the rate at which events happen, so that the probability of an event happening in a short time interval is the length of time multiplied by the hazard. Although the hazard may vary with time, the assumption in proportional hazard models for survival analysis is that the hazard in one group is a constant proportion of the hazard in the other group. This proportion is the hazard ratio. When expressing the results of clinical trials, the hazard ratio conveys no information about the size of clinical effect and should be considered alongside a measure of time, usually the median time to the event under scrutiny comparing active treatment and control groups (the points at which half the subjects have experienced the event in each arm of the study).